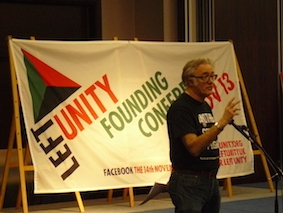 Steve Freeman of the Republican Socialist Alliance in England writes the following report of the Left Unity Conference held in Manchester on March 29th. This was held on the same day as the National Forum of the Radical Independence Campaign in Perth. There was a remarkably good showing for the RSA motion, in the face of the combined opposition of the current LUP leadership and an amalgam of the British Left organisations present on the day. The RSA has attracted a lot of new support and it is fairly clear that when it further develops its organisation, the LU’s ‘Neither for/Nor against’ position could be overturned. In the meantime several LU branches are proceeding with organising solidarity events anyhow. Meanwhile, the RIC National Forum in Perth unanimously passed its motion in support of an ‘internationalism from below’ approach to the campaign for Scottish independence. In England a new party, Left Unity has been formed. Sponsored by Ken Loach it held its second policy conference in Manchester on 29 March. The issue of Scotland, originally at the end of the agenda, was moved up to the middle to ensure it was taken on the day. A resolution calling for support for a ‘Yes-Republican’ position and for backing the Radical Independence Campaign was narrowly defeated by seventy votes to sixty eight with twenty abstentions. The republican socialists in Left Unity were encouraged by this result. A virtual draw was closer than expected. But the voting pattern showed it was eminently winnable. The defeat was down to the switching sides by of leading members of Socialist Resistance. Alan Thornett, one of the members of Socialist Resistance had supported the resolution in Southwark branch and then voted against it in the conference. Another leading member, Terry Conway, spoke in favour of a Yes position and then voted against the resolution. The resolution was endorsed by the Southwark and Worcester Left Unity branches. (Full text is at the end). It was moved by Steve Freeman, supporter of the Republican Socialist Platform, with strong supporting speeches from Mark France (Worcester) and Lesley Mahmoud (Liverpool). It was made clear that this was not about telling Scottish people what to do but primarily about building solidarity in England and Wales. Those voting against were CPGB, Workers Power, Alan Thornett and Terry Conway of Socialist Resistance (SR), the Glasgow branch of Left Unity (which was divided between Yes and No and wanted to avoid LU taking a Yes/No line), Kate Hudson, Andrew Burgin, John Penney and some members of the International Socialist Network. After the resolution was declared lost by chair’s inspection there was a challenge and a recount which embarrassed the chair when it turned out with 68 for and 70 against with 20 abstentions. We do not know the reasons for the SR switch. It has been suggested that it was the result of an agreement between SR and the leading group in Left Unity around Kate Hudson and Andrew Burgin. But there is no proof or confirmation of that. Socialists have a right to know why SR switched and whether rumours of an agreement are true. Nobody in Left Unity admits to being British Unionists. Everybody says they are “internationalists”. But today on the radical left, British Unionism takes on the guise of ‘neutrality’ and the pretence of not taking sides. In some cases this translates itself into calling for voters to abstain. Unionism on the radical left takes the form of a “Dare not say ‘No’ and too frightened to say ‘Yes” campaign. Fear of the Scottish people unchained was expressed in alternative resolutions from the Glasgow branch and the Communist Platform. George Galloway is not so reticent. In the National Forum each branch and affiliated organisation sends two delegates. There were delegates from the following branches – Aberdeen, Dumfries & Galloway, Dundee, East Kilbride, Edinburgh, Glasgow Southside, Glasgow West, Inverness, Perth, and Stirling (with apologies from Montrose); the following political organisations – RCN, SSP, SWP; and the following campaigns, Scottish CND, Scottish Federation of Socialist Teachers and Trade Unionists For Independence. The National Forum (RIC) voted to provide speakers for meetings organised by socialist and radical organisations in England, Wales and Ireland where support for Scottish independence is being discussed. The RIC supported a proposal from the Republican Socialist Alliance and the RS platform in Left Unity (party) to organise a conference in England around the issue of support for Scottish independence. This conference recognises the right of the Scottish people to national self-determination. We note the long, close and mutually supportive relations between the working class movements in Scotland and in England and the rest of the UK. Regardless of whether Scotland becomes independent or not we will do what we can to bring the working class movements into closer unity and solidarity. We note that the British ruling class through the current Cameron government supported by the Liberal Democrats and Labour has threatened to ban the Scottish people using the pound sterling in a currency union. This constitutes a declaration of war by means of economic sabotage. We note that the British ruling class has used its influence with the EU bureaucracy to threaten to exclude Scotland from the EU and deny access to European markets and any rights held since 1976. We note that the Cameron government will face a serious political crisis and the Cameron led Coalition may come to an end if it fails to win a No vote in the September referendum. Explain why a sovereign democratic secular and social republic would not only be in the interests of the Scottish people but would encourage similar democratic movements in England, Wales and Ireland. Recognise the importance of the Radical Independence Campaign as an organising centre for a republican and internationalist approach to the question of Scotland’s democracy. Help establish a “Hands Off the People of Scotland” campaign to counter the threats and bullying tactics of the Unionist coalition of Tory, Liberal Democrat and Labour politicians. This motion from Edinburgh RIC branch was passed unanimously at the RIC National Forum in Perth.